Jonathan Wilson examines the 24-team Euro 2016 field as participants tune-up for the competition with high-profile friendlies across Europe. The start of Euro 2016 is just over two months away, and with the current international fixture window a time for teams to fine-tune and iron out details prior to the club season run-in, there's no better time to examine the field of 24 and size up where each team stands. The field can be split into three distinct categories–the contenders to win it all, those who have offered glimpses of an ability to compete and those who are long shots to replicate what Greece did in 2004 and win in stunning fashion. Germany is beset by a very modern problem. It may be the world champion, it may have a side replete with great midfielders, and it may have rattled in 24 goals in qualifying, more than anybody other than Sweden and England, and yet it frets about the lack of a high-class striker. It was the reintroduction of the 36-year-old Miroslav Klose that gave Germany the spurt that took it to the World Cup on Brazil two summers ago, restoring the structure than gave it stability, but he has gone now and nobody has emerged in his place. Thomas Muller did score nine goals in qualifying, mostly coming from a deep position, but, in the absence of any more convincing alternative, it seems likely Jogi Low will again field Mario Gotze as a false nine of Saturday’s friendly against England in Berlin. A game against Italy in Munich on Tuesday offers further chance for experimentation. The ramifications of the Karim Benzema blackmail allegations rumble on but, other than that, the host France has only one major difficulty: a surfeit of high-class players. Without a qualifying series to refine Didier Deschamps’s thinking, it’s still far from clear who he will be forced to cut from his squad, never mind getting around to selecting the actual starting 11. As a result it seems almost a side issue that Dimitri Payet, after a stellar season for West Ham, has been recalled to the national squad after a lengthy absence. There’s talk about a final chance of playing his way into the side as France faces the Netherlands in Amsterdam Friday and Russia in Paris on Tuesday, but, realistically, with the likes of Paul Pogba, Blaise Matuidi, Morgan Schneiderlin, Yohan Cabaye and Lassana Diarra already established, he is playing for a place in the squad. The two games may also give an indication whether Deschamps prefers Olivier Giroud or Andre-Pierre Gignac at center forward (assuming the Benzema situation does not resolve itself). Reigning European champion Spain offered signs towards the end of qualifying that it is rising again. Aritz Aduriz’s goal in Thursday’s 1-1 draw with Italy provided further evidence that he should be the main central striker as the 35-year Athletic Bilbao forward continues to enjoy his remarkable late flowering. Certainly the team looked more fluent with him rather than Diego Costa, who has always been rather lumbering for the national side. The other alternative is Alvaro Morata, in fine form for Juventus, but he was used in a wide left role against Italy. There may be further experimentation against Romania in Cluj on Sunday, but come the tournament, it’s likely that the familiar midfield center of Sergio Busquets, Andres Iniesta and Cesc Fabregas will return. Italy itself progressed through qualifying with a familiar remorselessness, unbeaten in 10 games, without ever really dazzling. A pair of 1-0 wins over Malta hardly suggested great attacking freedom. Although there was some dabbling with a back four, it always seemed likely that Antonio Conte would deploy a back three in the tournament itself, and his use of it against Spain seemed to confirm that. Security concerns have understandably dominated the build-up to Belgium’s friendly against Portugal, which has been shifted from Brussels to Leiria after the terrorist attacks that killed 31 people in the Belgian capital on Tuesday. This is arguably the greatest generation of players in Belgium’s history, but qualifying offered little evidence that Marc Wilmots has learned from the World Cup how best to arrange them. The most obvious issue is at center forward, where Christian Benteke, Romelu Lukaku and Divock Origi are all fighting for one place. ​Portugal, which faces Bulgaria Friday, must decide whether Cristiano Ronaldo is to be used as a central striker or on the flank cutting in in a 4-3-3. There is arguably greater strength in midfield than Portugal has enjoyed for years, even with the likes of Andre Andre, Miguel Veloso and Joao Moutinho missing out this time, but the Ronaldo factor weighs heavy. Croatia tried three different formations in beating Israel 2-0 in a friendly on Wednesday, none of them hugely convincing. It plays Hungary on Saturday and is likely to return form the back three to a 4-3-3, with the major concern being the balance of a midfield. The suspicion is that Luke Modric, Ivan Rakitic and Mateo Kovacic can’t all play together. Can England really challenge? Fifty years on from its only success in an international tournament, there’s a weary resignation about the build-up, but England is unburdened by stars or the sort of celebrity players who demand selection, and that may play into the pragmatic hands of Roy Hodgson. He has pace in forward areas and in Eric Dier and Dele Alli, a pair of young midfielders used to playing together. After a successful qualification campaign largely based around plugging away against resolute but defensive opponents, games away to Germany and at home to Netherlands offer an opportunity to test England’s abilities on the counter, which are likely to be far more relevant to how it will play in the tournament itself than the attritional proactivity of the past two years. Having played the same starting lineup in each of its last six qualifiers, Austria faces Albania on Saturday with few concerns other than fine-tuning, and that consistency itself is one of its strengths. This is a side that not merely is good at playing together but wants to play together–nobody is withdrawing with slight knocks. Russia has also had a remarkable consistency of recent selection, with Leonid Slutsky selected only 13 outfield starters for the four games in which he resurrected its qualifying campaign. His problem is that this is an old squad–so old that there are legitimate concerns about whether it will stand up to the rigors of three group games in nine days. Friendlies against Lithuania and France are a chance to try to introduce new blood. Switzerland faces Ireland and Bosnia-Herzegovina after an inconsistent qualifying campaign. There is a very strong core of players there, based around Xherdan Shaqiri, Grant Xhaka and Gokhan Inler, but there’s been little indication yet that Vladimir Petrovic has quite worked out a tactical system to get the best out of them. Having beaten Serbia on Tuesday, Poland takes on Finland on Saturday with a fairly clear idea of how it will go into its first game in France, against Northern Ireland. Grzegorz Krychowiak will hold at the back of midfield, with Jakub Blaszczykowski on the right, Kamil Grosicki on the left and Arkadiusz Milik supporting Robert Lewandowski through the middle. All that remains to determine is the precise balance and who the other central midfielder is. There’s no reason for Wales to panic, but, having lost to the Netherlands in November, a draw against Northern Ireland on Tuesday, secured only with a very late equalizer, is perhaps cause for some concern–although it was without Gareth Bale, who will also miss Monday’s game against Ukraine. This is a solid rather spectacular Ukraine and, while a 1-0 win over Cyprus on Thursday was far from thrilling, it did give a number of fringe players a run out. Something closer to a full-strength side may be anticipated for the visit of Wales. The sense of Turkey as a coming force was enhanced by a 2-1 win over Sweden on Thursday, although the suspicion is that next week’s clash with Austria will be a tougher test of a side that finished qualifying with a charge. Sweden faces the Czech Republic on Tuesday looking, as ever, to prove it is more than just Zlatan Ibrahimovic and an aging midfield. Spain left no doubt who is still the best team in the world, beating Italy in the biggest final rout in championship history. David Silva, Jordi Alba, Fernando Torres and Juan Mata scored, and Iker Casillas pitched a fifth straight shutout. Spain became the first nation to notch the international treble -- two straight European championships with a World Cup in between. 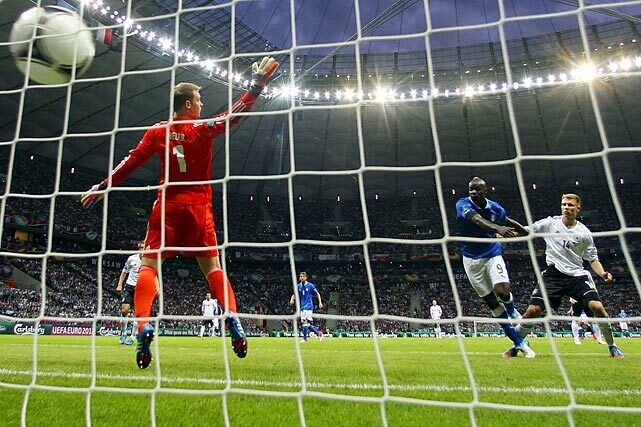 Mario Balotelli brought Euro 2012 back to life with two thunderous goals in the first half. In true Balotelli fashion, he received a yellow card for his shirtless celebration after the second score. Italy hung on in the second half -- despite Mesut Ozil's injury-time goal -- to advance to its third Euro final. Germany, favored to win, was left with another disappointment, having not won a major tournament since Euro 1996. 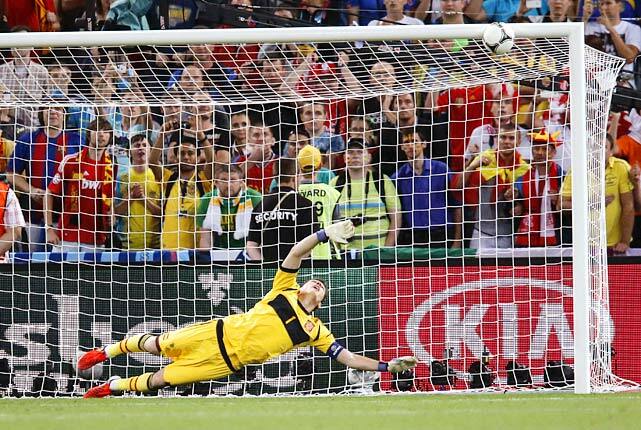 It was an ugly, physical effort from two typically refined sides, but Spain advanced to their third consecutive major tournament final with a 0-0 (4-2) victory in penalty kicks over Portugal -- a shootout that shockingly did not feature Cristiano Ronaldo. In a game that featured 52 fouls and nine yellow cards, Spain's performance was lackluster until extra time while Portugal's approach was tough and defensive all game. Both teams missed their opening penalty kicks, but Cesc Fabregas would clinch the game in the same fashion he clinched the Spain's 2008 quarterfinal against Italy. Ronaldo was due to shoot fifth, but he was never allowed to stare down his club teammate, Spanish goalie Iker Casillas, after national teammate Bruno Alves's shot rung off the crossbar. After two hours of clever, often dominating but in the end fruitless play, Italy found the answer against England. Penalty kicks. Alessandro Diamanti (shown) scored the decisive kick Sunday to send Italy through to the European Championship semifinals with a 4-2 win in the shootout following a 0-0 tie with England. Xabi Alonso scored two goals in his 100th international appearance Saturday, leading Spain to spot in the European Championship semifinals. Alonso first scored with a thumping downward header in the 19th minute and then converted a penalty in injury time. The win was Spain's first over France in a competitive match in seven attempts. 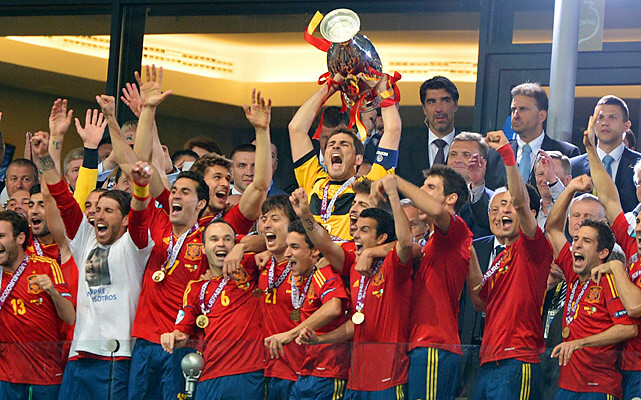 Spain will next face Portugal on Wednesday in Donetsk as it bids to win a third straight major title. Germany advanced to the Euro semifinals after Sami Khedira's dazzling strike in the 61st minute (pictured), the first of three goals in a 14-minute span to give it a 4-2 victory over Greece. Philipp Lahm gave the Germans a 1-0 halftime lead with a 39th minute strike, but Greece delivered a second half surprise when Georgios Samaras slotted home an equalizer off of a Dimitris Salpingidis cross. It didn't take long for the Germans react. Khedira's volley six minutes later eroded Greece's momentum, and goals by Miroslav Klose and Marco Reus provided insurance. Klose has now scored in his five major international tournaments. Cristiano Ronaldo continued his dominant tournament performance with a 79th minute header to send Portugal to the semifinal. Despite controlling most of the match, Portugal finally overcame some lackluster execution when Ronaldo's header skipped past Czech Republic goalie Petr Cech. The Portuguese advance to the semifinals for the first time since they hosted the tournament in 2004. 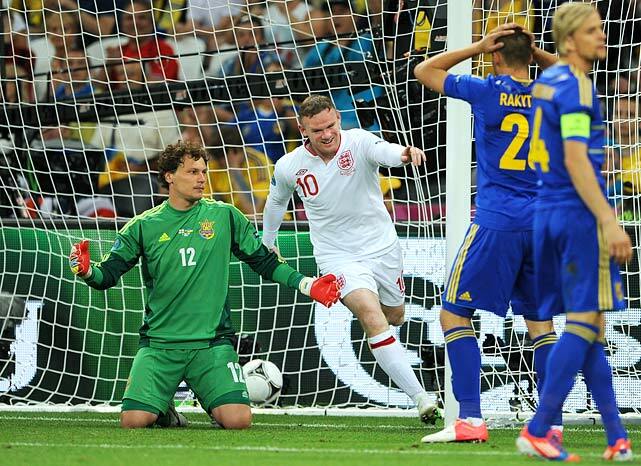 Wayne Rooney scored the game's lone goal in his return from a two-game suspension and England won Group D with a 1-0 defeat of Ukraine. While the co-hosts appeared to be the better technical side, coach Oleg Blokhin's team could not find its way past Joe Hart -- at least officially. Marko Devic appeared to finish a promising chance off of a counter-attack, but the fifth official ruled that the shot did not cross the line. Though very close, replays showed the ball over the line. England will move on to play Italy in the quarterfinals. After two strong performances to open the tournament, France was run ragged by a superior Swedish side. The Swedes scored on a stunning volley from Zlatan Ibrahimovic in the 54th minute and easily sustained a rather toothless French attack. Sebastian Larsson provided an insurance goal in the 90th minute to assure Sweden left the tournament with three points. France advances to play Spain in the quarterfinals, and coach Laurent Blanc is surely worried after an unimpressive performance to close group play. Needing a victory against Ireland and any result below a 2-2 draw, Italy played an uncharacteristically aggressive second half to defeat former coach Giovanni Trappatoni's side and advance to the quarterfinals. Mario Balotelli scored a terrific volley in the 90th minute to pad a lead established by Antonio Cassano in the 35th minute. 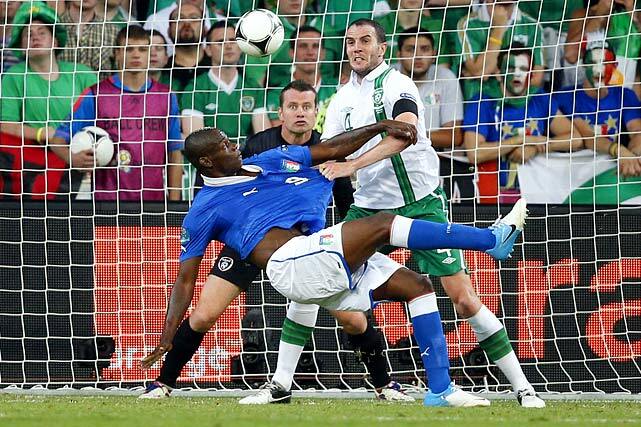 Ireland never honestly tested Italian goalie Gigi Buffon, despite playing its strongest game of the tournament. Iker Casillas' save on Ivan Rakitic's header in the 59th minute preserved a scoreless duel that Spain later broke to win Group C and advance to the quarters. Jesus Navas sealed a 1-0 win for Spain, but the defending World Cup champions put forth a lackadaisical performance that included several key chances from the Croats. Described as "insipid" and "uninspired" on the attack, coach Vicente del Bosque's side did not inspire the audience after a blowout win over Ireland. Spain still finishes atop Group C and will take on the runner-up in group D.
Perhaps no team suffered a crueler fate than Denmark, who beat the Netherlands and entered the final 15 minutes tied against both Germany and Portugal. The Danes needed a victory against the tournament favorites to advance, but Lars Bender's 80th minute goal put the Germans ahead to secure their victory in Group B. Germany will play Greece in the quarterfinal, a game with some amusing political and economic overtones as Germany functionally controls the viability of the Greek economy. Cristiano Ronaldo has heard plenty of criticism for his international struggles. If he continues to play the way he did in Portugal's 2-1 defeat of the Netherlands, he may contend for top honors at Euro 2012. Ronaldo was wondrous in the midfield, scoring twice and creating a litany of chances in Portugal's dominance of the disappointing Dutch. The World Cup finalists wilted in the "group of death," losing all three matches and receiving underwhelming play from all except new starter Rafael Van der Vaart. Portugal advances to the quarterfinals to face the Czech Republic in the quarterfinals. With the goals, Ronaldo became the first Portuguese national to score in five different major tournaments. It only needed a draw to advance, but Russia shockingly lost to defensive-minded Greece in one of the top upsets of the tournament thus far. Russia played a sloppy game, firing 25 shots, most of which were long, speculative chances. Greece used a 45th minute strike from veteran striker Giorgos Karagounis to take a lead it would not surrender and steal the second qualifying spot in Group A. Despite blowing a 1-0 lead, England won the type of game they are known for losing. 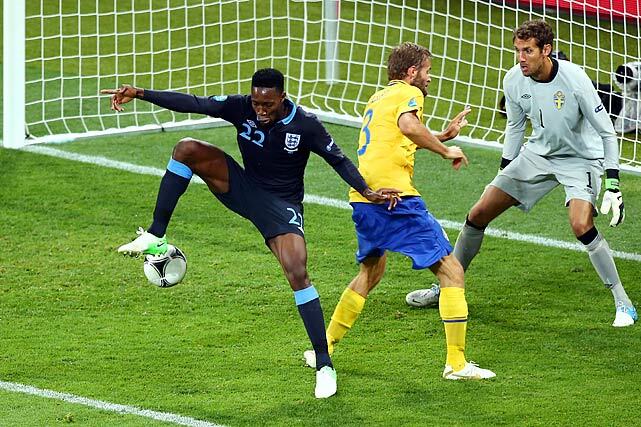 Danny Welbeck capped an impressive comeback with an astonishing goal off of a back-heel, and the English furiously rallied after Olof Melberg put the Swedes ahead 2-1 in the 59th minute. Theo Walcott played maybe his finest match of his international career, scoring the tying goal in the 64th minute and assisting on Welbeck's go-ahead tally. After an hour long rain delay because of a fierce thunderstorm, France overcame a slow start and some torrential conditions to knock off host Ukraine. Jeremy Menez (14) and Yohan Cabaye scored goals three minutes apart from one another and Ukraine only mustered one shot on goal the entire evening. France now tops the group and finishes off group play with Sweden. Despite his recent struggles, Spain's Fernando Torres looked much like his former self, smashing home a goal in the fourth minute en route to an easy 4-0 win over Ireland. The match was completely lopsided, but the Irish fans still hung around to loudly sing "The Fields of Athenry" in the closing minutes of the match. After dominating the first half, the Italians suffered from a tactical decision to defend instead of attack in the second half after Mario Mandzukic scored his third goal of the tournament to tie the game for Croatia. The Italians now must beat Ireland, who is coached by former Italian national coach Giovanni Trappatoni, and have either Spain or Croatia win their match. After losing to the group's lowest-ranked squad, the Netherlands could not overcome an early 2-0 deficit against tournament favorite, Germany. Two early goals from Mario Gomez put a significant dent in the Dutch's qualifying hopes, as they could not come back despite an impressive goal from Robin Van Persie. Just two years after advancing to the World Cup Final, the Dutch have zero points with one game remaining. It was the type of excitement expected from a game in the "Group of Death", and it took a magnificent strike from a little-known Portuguese reserve to separate the two sides. While international superstars Cristiano Ronaldo and Nani could not convert generous chances, Varela, who had come on three minutes before his goal, smashed home a volley inside the penalty area just seven minutes after Nicklas Bendtner equalized for Denmark. In another exciting draw, the Poles needed an explosive shot from Jakub Blaszczykowski to beat Russian keeper Vyacheslav Malafeev, who turned away several great Polish chances throughout the match. Alan Dzagoev scored his third goal of the tournament to become the leading scorer in Euro 2012, but it was Malafeev that kept the Russians at the top of Group A. After a disheartening 4-1 loss to open the tournament, the Czechs came out firing in their second game, scoring two goals in the first six minutes en route to a 2-1 victory over Greece. 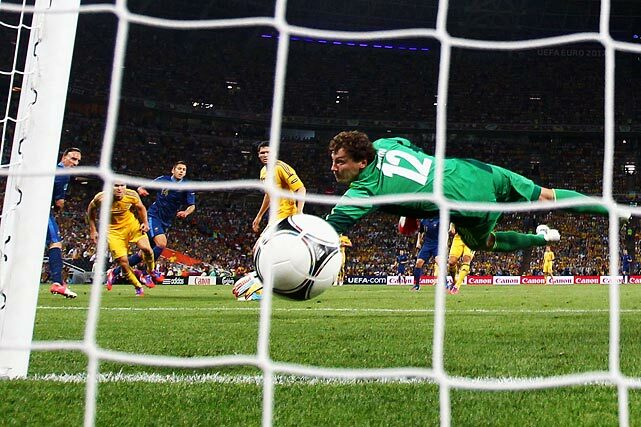 Though Petr Cech allowed a second half goal after an uncharacteristic flub, the Greeks could not create a threatening scoring chance the rest of the match. It was the requisite "blast from the past" game of the tournament thus far, as Ukranian veteran Andriy Shevchenko provided ample cheering fodder for the home fans in Kiev. Considered by some pundits as a nostalgic selection for the national team, Shevchenko hardly looked 35, blasting home two headers and helping control possession for Ukraine. The nation's all-time leading goal scorer was met with raucous applause when he was subbed out in the 81st minute. Despite missing Wayne Rooney due to suspension, England struck first with a goal off of defender Joleon Lescott's bald spot. France equalized nine minutes later with some crafty footwork from Samir Nasri, but the game took a sluggish turn and produced few other exciting moments. Despite tremendous anticipation for the first major international game in ten years, Ireland's normally sturdy defense struggled early in a 3-1 loss to Croatia. Though the Irish were able to tie the game shortly after surrendering a third-minute goal, Croatia midfielder and Everton star Nikica Jelavic finished a chance right before halftime and seemingly killed Ireland's confidence. The star-studded battle of the two former World Cup champions lived up to its billing, producing an exciting match that saw goals only three minutes apart from one another and several slight misses. After the Italians struck first on a magnificent through-ball from Andrea Pirlo to Antonio Di Natale, the Spaniards equalized almost immediately. David Silva's wondrous flick pass to Cesc Fabregas allowed the Barcelona midfielder an open look at the net, and he would not miss his chance to beat Italy's stud keeper, Gianluigi Buffon. It was a rather dreary affair from two usually exciting squads, but the Germans rose to the top of the "Group of Death" after a 72' minute header from forward Mario Gomez. The typically efficient Germans controlled the midfield, anchored predominantly by Mesut Ozil, who, along with countryman Sami Khedira, was facing off against Real Madrid teammates Cristiano Ronaldo, Pepe and Fabio Coentrao. In the upset of the tournament thus far, the Danes used an early strike from Michael Krohn-Dehli to shock the World Cup finalists. It was a wide-open affair that saw the Dutch attempt 28 shots, but only eight were on frame and none could beat Danish keeper Stephan Andersen. In a classically Soviet matchup, young speedster Alan Dzagoev was the star of the Eastern Bloc Party. The much-hyped 21-year old netted two past Czech goalie Petr Cech and the Russians routed, 4-1, the Czechs despite a slow start. The opener may have ended in a 1-1 draw, but it remains one of the most thrilling matches of the tournament thus far. A 17th minute strike from the Robert Lewandowski gave the Poles an early 1-0 lead, and a 44th minute red card to Greece's Sokratis Papastathopoulos appeared to secure an early victory for the notoriously hard-luck Poles. But despite losing a man, the Greeks, led by substitute Dimitris Salpingidis, blitzed the Poles early in the second half. The reserve forward tied the game in the 51st minute and then earned a penalty kick twenty minutes later after Poland's star goalie Wojciech Sczcesny tackled him on a breakaway. Sczcesny was subsequently ejected, but veteran Giorgos Karagounis, the most capped player in Greek history, could not beat Polish reserve goalkeeper Przemyslaw Tyto from the penalty spot to take the lead. Iceland was perhaps the best story in qualifying as it maintained the form it had shown in narrowly missing out on the World Cup to eliminate the Netherlands. It has lost six of its last seven matches–including a 2-1 loss to Denmark Thursday–though, since securing its place in France. There aren’t too many options in terms of personnel, but a win over Greece on Tuesday might bolster confidence that must have been shaken by recent results. Romania may lack of the stars of the past, but it had the best defensive record of any side in qualifying, so it was no great surprise to see it scraping by Lithuania 1-0 on Wednesday. Spain on Sunday is a test of whether it can also frustrate more vaunted sides. ​Czech Republic impressed in qualifying, eliminating the Dutch, but Thursday’s friendly defeat at home to Scotland raised serious questions about its capacity to break down dogged opponents. An away game against Sweden on Tuesday, perhaps, is an opportunity to show that there is cutting edge as well as neatness to its midfield. After an impressive start to qualifying Slovakia rather stumbled over the line, but recent friendly results suggest a side that is beginning to rediscover its form. Robert Mak’s two goals from the right flank saw off Iceland 3-1 in November. A game against Latvia Friday and Ireland on Tuesday should be about polishing the 4-2-3-1. Ireland’s qualification was the result of its traditional virtues of doggedness and energy. Friday's game against Switzerland then the Slovakia match are probably about practicing defensive shape, although they will probably offer confirmation that Robbie Keane’s time as a starter is over as well as giving some indication how large a role Martin O’Neill sees Wes Hoolihan having in France. For Northern Ireland, going so close to beating Wales was further confirmation it is worthy of its place in France. Without a huge pool of players to from which to select, Monday’s friendly against Slovenia is less about issues of selection than getting the shape right–and working out who will replace the inured Chris Brunt at left back. Hungary got through its playoff against Norway thanks to the unexpected emergence of the turbulent but gifted 21-year-old midfielder Laszlo Kleinheisler. Saturday’s game against Croatia feels as much about tracking his development as anything else. Albania, meanwhile, goes to Austria with few ambitions other than proving its defensive resilience before a first ever appearance at a major tournament.